It began in The Windy City, but Bump Club and Beyond is now the largest social event company the country, hosting events in over twenty-five major markets. BCBEAUTY BASH IS BACK! NEW LOCATION. NEW PARTNERS. BIGGER & BETTER THAN EVER. Join us for an evening of makeup, manicures, blowouts and more! Plus go home with a gift bag of some of the best beauty buys around. Drinks and apps will be on hand to get the party going. Bring a donation for Share our Spare and you could win an amazing raffle prize! BCBeauty Bash - Spring 2019! Join us on Saturday, May 4th for the 9th Annual Best of Bump Club and Beyond! Best of Bump Club and Beyond is designed to bring you the best resources and information from the best experts in the industry. Best of BCB will have seminars for expectant parents, new parents and parents with toddlers. Meet the BEST brands and check out all of their top gear for you and baby. Opportunities to access the Gearapalooza seminar with The BabyGuyNYC! Attend educational seminars from baby industry leaders and many of our Resident Experts on breastfeeding, the transition to parenthood, CPR and more! *Check back soon for the 2019 seminar schedule! * Take home a gift bag FILLED with goodies from our sponsors and partners. Many of our attendees will go home with THOUSANDS OF DOLLARS in big ticket items including strollers, high chairs, bedding, cribs and more! All tickets include full lunch, snacks and refreshments throughout the day! ENTER TO WIN PRIZES ALL DAY LONG for the chance at $10,000+ IN GIVEAWAYS FROM OUR SPONSORS AND EXHIBITORS. ***Gearapalooza discount codes are NOT ELIGIBLE for Best of Bump Club and Beyond. Join The Barre Code Chicago for a *FREE* prenatal class presented by aSweatLife and Bump Club & Beyond. Everyone’s pregnancy is unique and individual –celebrate your strength with a 50-minute guided workout that is designed to be taken at your own pace and learn the best modifications to help you feeling strong & supported throughout your entire pregnancy! Join us for our 2019 Expectant Parent Dinner Series sponsored by ViaCord and Ergobaby! Our BCB Resident Experts will discuss diapering, swaddling, bathing and car seat safety. Get all of your questions answered - and practice some new skills needed for bringing home baby! Experts include a CPST and RN. June BCBumps Expectant Parent Dinner: Baby Basics Bootcamp! Join us for our 2019 Expectant Parent Dinner Series sponored by Ergobaby and ViaCord! BCB's Resident Expert, Janeen Hayward of Swellbeing, will discuss the safety standards and techniques for newborn sleep. Join us for our 2019 Expectant Parent Dinner Series sponsored by ViaCord and Ergobaby! Breastfeeding 101: The Girlfriend's Guide to Breastfeeding BCB Resident Experts, The Lactation Partners, will guide you through what to expect when you begin your breastfeeding journey. Hear what to expect from your first day, week and months as you begin breastfeeding. The Lactation Partners will answer all of your questions and provide you with the best tools for a successful breastfeeding plan. Join us for our 2019 Expectant Parent Dinner Series sponsored by ViaCord and Ergobaby! Secrets of the New Mom Sisterhood: What to expect during labor, delivery and the first weeks at home. Our BCB Resident Experts will discuss what to expect through labor and delivery! Get all your burning questions answered - all of them 🙂Experts include an OBGYN, Doula, IBCLC, Therapist. The chance to meet the best baby gear vendors and test out the latest products. A 60 minute educational seminar + Q&A from The BabyGuyNYC, answering all your questions about car seat safety, best strollers, pumps and more. A jam-packed gift bag filled with essentials for mom + baby. The chance to win thousands of dollars in prizes! PLUS, bring a donation for Share Our Spare and receive an extra raffle ticket to increase your chances of winning! Exclusive event day discount to shop with Sprout San Francisco and Windy City Bebe! Join us for our 2019 Expectant Parent Dinner Series sponsored by ViaCord and Ergobaby! BCBaby Basics Bootcamp Our BCB Resident Experts will discuss diapering, swaddling, bathing and car seat safety. Get all of your questions answered - and practice some new skills needed for bringing home baby! Experts include a CPST and RN. 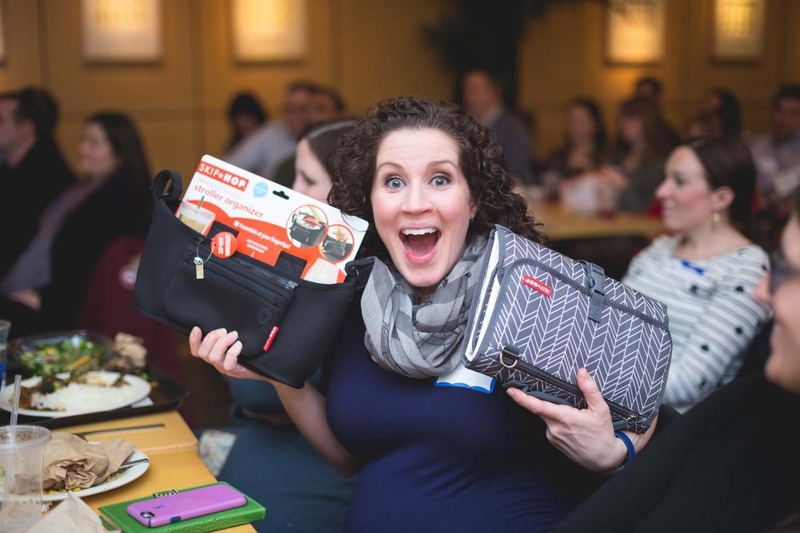 December BCBumps Expectant Parent Dinner: Baby Basics Bootcamp!